Happy Thanksgiving everybody. I’m sitting in a stranger’s kitchen right now minding Sherin’s second turkey of the day. Granted, my turkey was supposed to be in the oven two hours earlier and I have yet to taste it or get reviews, but I’m going to walk into this one with my charateristic confidence: Everyone who claims that cooking a Thanksgiving turkey is some dificult task that requires a day of slaving away is a liar. Let’s get caught up on the last month. In Neuro, I’ve learned a little about sleep, arousal, emotions, EEGs and others. Drug Addiction was the most boring lecture of the bunch which hardly seems fair. Please, just once, I would like someone like Anthony Keidis (Red Hot Chili Peppers) to come and give a guest lecture. That’s not too much too ask for all this money. In Physiology, we’ve gone over the intestines and kidneys. It seems inappropriate to talk about mass movements and micturition reflexes with such a regal accent. It makes everyone feel dirty as they head to the bathrooms. In droves. The schedule of first term classes is finally starting to crack people. I opened the doors of an elevator to discover someone sitting on a chair with highlighter in mouth, pen in hand and notes on lap. I also found (by complete accident) a student studying underneath the stairwell. We have given these people appropriate nicknames. The rest of us are trying to find ways to relax. Sherin and I tried unsuccessfully for five weeks to go to dinner for our second formal date. The food was great, the waiter was drunk, and Sherin kept talking about Ryan Corabi. Ryan is one my closest friends from JCU and may be the funniest. Ryan taught me the guitar, I taught him how to read. I thought it would be a good idea to have Sherin email Ryan to get a better idea of who I was in college. Unfortunately, Ryan was a little too funny. So funny that Sherin started calling her friends so that she could READ OVER THE PHONE his entire email. “When can I meet Ryan?” “Can Ryan come to Grenada?” “Am I Ryan’s type?” It never ends. And another thing, Sherin (she reads these). YOU CANNOT HAVE MY HAT. Dodgeball. Last term we got together a group of eight guys to form Team Conch and Balls. We were one of the few teams to make uniforms depicting an injury to the brachial plexus. We lost last term to the team that eventually won and began training on that day for this term. Now for some reason I don’t own white tshirts and GND doesn’t have any either. Instead, they have oversized V-necks which make quite the show of my chest hair. I’m not ashamed. I’ve been told I looked like an angel. We spent one full night coming up with tshirt designs and logos. Our team mascot was “decorticate posturing” with boxer shorts. We had groupies, flags, and redbull. We were unstoppable. We ended up losing to a team of cheaters. I know I know, everyone says that. But team Conch and Balls takes things seriously, had video footage, and showed it to the judges. Day late, dollar short, all that. Like the good sports that we were, my teammates grabbed the flags and circled the courts with moral-victory laps. Getting outside gets harder and harder in the rainy season. The rains started at night, every night, for hours before gaining strength and taking over the day. I’m not saying I would have gone anyway, but I’m sure it made it hard for a lot of stdents to get to class. It also drove animals indoors and we now have a mice problem. My roomate Kelly was born in Kenya and spent most of his youth throughout Africa and Australia. This is how I learned about the New Zealand mouse trap. It is brillaint and cheap. You take a bottle, cover it’s neck in margarine and its body in a sock, stuff cheese into the opening and set it over a counter ledge above a bucket of water. Mouse goes for cheese, slips, drowns. I was so excited for this until we realized the next morning that our mouse was, in fact, MacGuyver. We’re still working out the kinks. In exciting news, I’M DOING RESEARCH! I’ll be working on two projects over Christmas break that should be ready for submission in February. I won’t bore you with the details unless you ask me, in person, to bore you. My class is filled with a bunch of overachievers that are admittedly late-blooming. But that’s neither here nor there. A friend of mine, Jeremy, is working now to create a group of students for our upcoming Patholgy class (in March) that will be responisble for preparing the material and presenting it to the rest of the group. Everyone in the class has to join a group of 10-15 people and your grade does depend upon your groups performance. Jeremy has decided to recruit the best talent and purge anyone with the slightest weakness. We all applaud Jeremy for the throat-cutting, but it got ridiculous the other day. Someone suggested that this girl, Jean, should be considered for the group. Now everyone already in the group gets a veto; one veto and you’re out of consideration without debate. Somebody expressed concerns with Jean’s ability to handle stress, so Jeremy decided to investigate. Last week during sunset, Jeremy left in the middle of conversation to stand OVER Jean, look down at her, and ask innocently, “So, Jean, are you panicking out about this exam yet? No? That’s surprising. Lot of material. Lot. Of. Material. Well good luck.” She was very unnerved and Jeremy had his answer: Jean out. Well I have to pull the turkey out and carve it with no idea how to carve it. Hope everyone back home is having a memorable holiday. Enjoy the silly pictres. Thanksgiving went off without a hitch, Sherin entertained and fed an impossible 30+ people, and no one has gotten sick. Congratulations Sherin. If you google my name, you get nothing. If you google my sister Kimberly, you get an outline of an athletic superstar. Congratulations Kimmy. Sheirn has a bruise. It’s on her knee. No no, you have to look at it. I’m giving you this update because I get this update, every day, look at the bruise. I have no way to explain the general fascination that women have with their bruises or their need to turn each one into its own story, though I can say that EVERY SINGLE ONE of them has at one point asked me to look at their proud bruise. I just finished the first season of LOST on DVD. I am now one of those annoying people that tries to push a favorite show on everyone else. GO WATCH LOST! My bike is still out of commission. The only person in Grenada that knows how to change a rear tire works in the capital. Can’t exactly get a busted bike to the capital, so in the meantime I’ve been filling it up with air and riding the leak. This ended upbruptly when the innertube popped out at the gas station and I had to have a Reggae bus crew help me force it back in with a pen and a wrench. It’s times like those that help me justify paying that guy in the capital to take a trip out to Lance Aux Epines. Halloween at the apartment was a big deal. We all took the Immuno final that morning and had afternoon off to go to the beach. Barring the ten minutes I get every day walking back and forth from the library, I haven’t gotten any sun or taken a day off in weeks. I’d be tanner if I was in STL. I had to laugh when we got to Grand Anse and a three hour rainfall began. Goodtimes. Time to make costumes. Kelly and Winston had traveled around the island pillaging dumpsters for cardboard the week before. Most of us had our ideas in cement for at least that long. Onto the pictures. 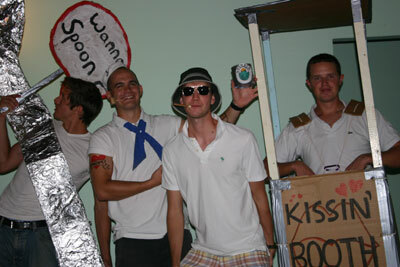 Kelly is the one dressed as cutlery, Winston is the one dressed as a carnival attraction, Sam is out of Fear and Loathing in Las Vegas, I’m eating spinach, Sherin went surfing too close to the reef and Lauren (Sam’s girlfriend) went as Ms. Patel, the Punjabi lady that has served me Indian Food everyday for almost a year. When we entered the party we owned the room. Good Halloween. What do you call a car parked in the middle of the road? A Grenadian traffic jam. You think I’m joking? This morning on the way to campus, there was a two-car traffic jam. One car was off and it’s driver was sitting outside while another driver pulled up beside him and started some business transaction. I had no idea what was going on until the paused driver continued past us with a drink and a smile. Sure enough out of this jerk’s trunk was a cooler and a sign: Lemonade 5EC. Ladies and gentlemen: the grendian lemonade stand. The new staggered exam system means that Immuno finished on Monday, Parasit began on Tuesday and has its final in two weeks. The week after is Neuro, the week after is Physio. Two days later is the Basic Sciences Competency Exam, an in-house test determining how much of the first year I have retained and determines the class rank on my transcript. I am not a fan of this system as it encourages cramming. It also means I’m stuck in the library from now till Dec 11th. Not a lot of time to come up with funny stories. Oh well. Almost a year, almost a year. topher. You are currently browsing the the rumors were true blog archives for November, 2005.